Composite seals are today’s modern dental practice. 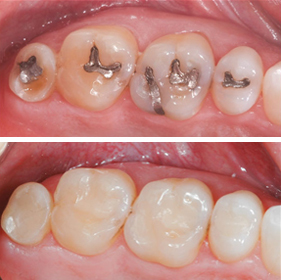 By using composite materials that have advanced significantly over the years, it is possible to make a composite seal that will ideally fit into the shape and color of natural teeth or replace the old amalgamic seal that has been esthetically and functionaly worn out. The advantage of composite materials is that it saves dental tissue due to less preparation compared to amalgam fillings and this is possible because of the chemical bond that composites make with dental tissue. Significantly improved characteristics and properties in relation to previous composites, today’s composite materials have experienced a true evolution in dentistry. It should also be noted that heavy metals that can negatively affect human health are not included in the body.